House Speaker Nancy Pelosi speaks during a news conference on Capitol Hill in Washington, Thursday, March 28, 2019. House Speaker Nancy Pelosi appeared to downplay the influence of the most progressive members of her caucus during a "60 Minutes" interview that aired Sunday. Pelosi argued that Democrats in the House are united in representing the "mainstream" of the party, and that Rep. Alexandria Ocasio-Cortez and her allies are "like five people." 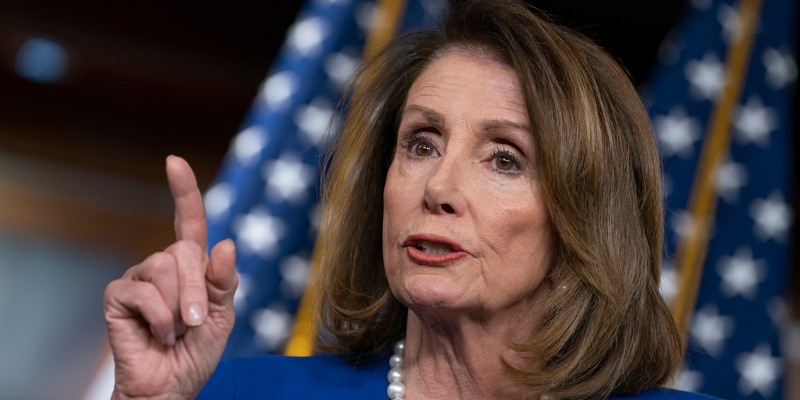 Tension between Pelosi and the progressive wing of the party came into focus over the last few days amid controversy over a comment freshman Rep. Ilhan Omar made about 9/11. House Speaker Nancy Pelosi appeared to downplay the influence of the most progressive members of her caucus, and argued that Democrats in the House are united in representing the "mainstream" of the party - despite significant disagreements between the moderate and progressive wings. Pelosi argued that Rep. Alexandria Ocasio-Cortez and other freshmen progressives are "like five people" during a "60 Minutes" interview with CBS's Lesley Stahl that aired Sunday. "By and large, whatever orientation they came with to Congress, they know we have to hold the center, that we have to go down the mainstream," Pelosi said. "You have these wings - AOC and her group on one side," Stahl said, referring to Ocasio-Cortez. "That's, like, five people," Pelosi said. When Stahl replied that the "progressive group" includes more than five members, Pelosi countered that she herself is a progressive. But Pelosi appears to recognize the sway that outspoken progressives, including Reps. Ilhan Omar, Rashida Tlaib, Ayanna Pressley, and Ocasio-Cortez hold among parts of the party, and gave them all plum committee assignments. Even after Ocasio-Cortez joined a climate change protest outside Pelosi's office last November, the Speaker put her on the House Oversight Committee - the House's most important investigative body - and the Financial Services Committee, along with both Tlaib and Pressley. And Omar was given a spot on the influential House Foreign Services Committee. A rift between Pelosi and more left-wing Democrats, including 2020 candidates like Sens. Bernie Sanders and Elizabeth Warren, came into focus over the last few days amid controversy over Omar's comment that "some people did something" on 9/11, referring to terrorists. After President Donald Trump tweeted out a video juxtaposing footage of Omar's remark with images of the Twin Towers collapsing on 9/11, Pelosi appeared to condemn both Omar and Trump in a statement. That elicited outrage from Democratic activists and some progressive lawmakers. Following the criticism, Pelosi issued a follow-up statement on Sunday calling for increased security for Omar and demanding Trump stop attacking the lawmaker.